If you read my "What's Up Wednesday" post then you saw what I was working on...and it was this post! 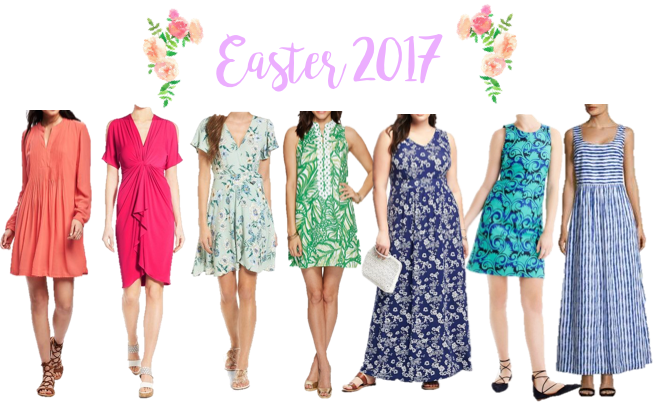 I've been rounding up my favorite potential Easter dresses from around the internet so that I can share them with y'all! I remember growing up, my very favorite thing in the world (once I was old enough to enjoy dressing up) was going and getting a new Easter outfit. If I was really lucky, my parents would let me pick out a cute new pair of shoes and maybe some matching jewelry as well for that Sunday. And today, although I don't always go buy something specifically for Easter, I still enjoy dressing up and wearing my best for Easter Sunday at church. And even if you don't go to church, we all like to treat ourselves every now and then, am I right?! I'm one who always likes to wear either bright colors/patterns, pastels, or white on Easter Sunday-it's the beginning of Spring, it's a celebration, so why not go all out. I tried to include something for all price ranges: Target, Lilly Pulitzer, J. Crew, some brands from Nordstrom, Old Navy, LOFT, Kate Spade, etc. Let me know down below what you'll be wearing this Easter! I love Easter outfits too, always so colorful, usually pastel, and they represent spring! I especially love that first orange one, so cute! I love dressing up for easter as well! All these dresses are beautiful! Love the Lilly Pulitzer.